The TAO Nightclub is a 10,000 square foot nightclub located in Tao at the Venetian, opening September 2005. 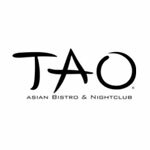 TAO Nightclub in New York City opened in 2000 and was immediately embraced by celebrities, sports figures and those in the know, catapulting the restaurant and lounge to iconic status. For the Las Vegas outpost, partners Marc Packer and Richard Wolf tapped to Noah Tepperberg and Jason Strauss to launch the ultimate nightlife facility in a city known for 24 hour entertaining. TAO was ranked at the top of the list for many years.